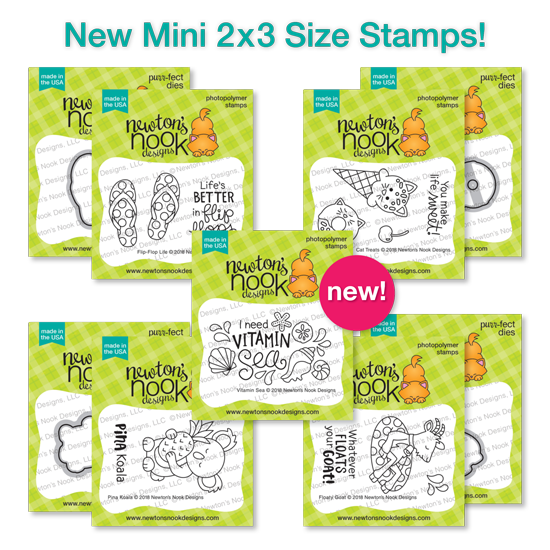 Hollybeary Creations : Newton's Nook July Release Day 4!! Happy Thursday everyone... It's almost time for our New Release Celebration coming on Friday. In the meantime, we have one more day of sneaks for you to hold you over. Today we are sharing Five new mini stamps sets and Four coordinating dies to the lineup!!! These are Super Fun little sets perfect for Tags, Mini Cards or you can use them for Full cards as well. Some folks are intimidated by smaller sets but there are many different ways to use them. And they can create a big impact on a card!! For my first card, I used our Sunscape Stencil to create a background on a piece of Bristol card stock I die cut with the small rectangle form the Frames and Flags die set. I used Squeezed Lemonade and Salty Ocean Distress Oxide Inks. Then I stamped the sentiment in the lower corner with some VersaFine Black ink. I adhered the panel to a Top folding A2 size White card base. I colored the Flip Flops in with Copics in Bright colors so they would really pop against the background. Then I added some Clear Wink of Stella to the Flip Flops for a little shimmer. For an added pop of Sparkle, I added some mixed Sparkling Clear Sequins. 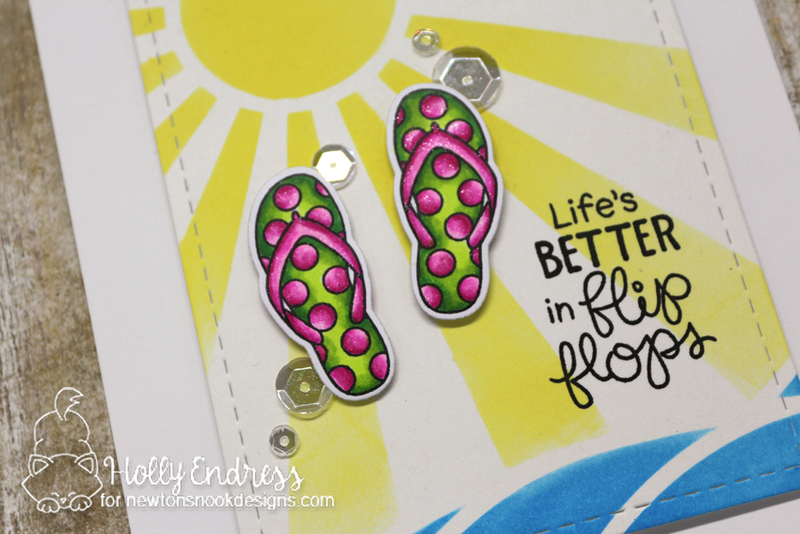 This is a great way to showcase the small flip flops and really make them stand out on a full-size card! 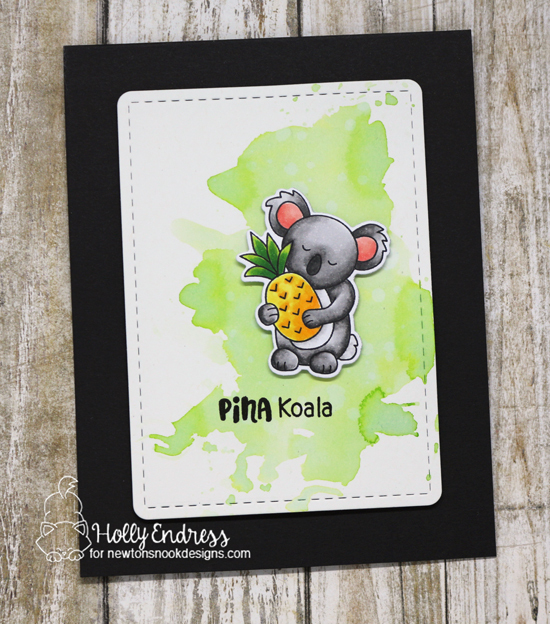 For my next card, I'm using the Pina Koala set, isn't he adorable with that little pineapple? I created a top folding A2 size Black card base and then I die cut a piece of Bristol cardstock with the same small rectangle from the Frames and Flags die set. I added some Mowed Lawn Distress Ink to create a bright background splash. Then I stamped and colored the Koala with Copics making sure to add a little Green to the image. I used the coordinating die to trim him out and I adhered him with some foam tape along the side and then I stamped the sentiment in a crisp Black ink. So cute!!!! Which of these mini sets if your Favorite? And don't forget to join us tomorrow as well for our Five Year Anniversary party and Blog Hop and all of the new products will be available in the store. 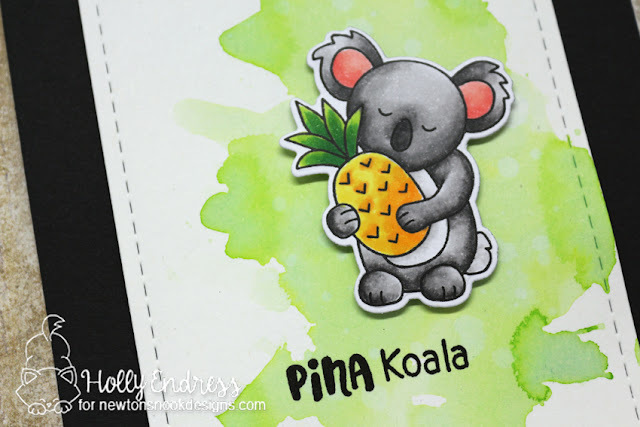 Pina Koala is so FUN! so are those flip-flops! Wonderful cards...love the cute koala and the fun flip flop design. under the flip-flops is great. These are darling! That koala is just the cuteness!! I love these mini stamp sets ! And your both cards are very summery ! I love these new stamps. They are perfect for us in Florida. Can’t wait for the flamingo’s stamp either!! Live this new release. Always love Newton’s Nook stamps, especially since I am a cat lover!! These new sets are so adorable! I love them all. And your cards are sweeeet!! Great colors on both. I like the polka dot flip flops. Pink and Green Flip Flops are my absolute favorite color combination! Beautifully colored cards! I like the blue splash of color behind the adorable Koala! Such adorable cards. 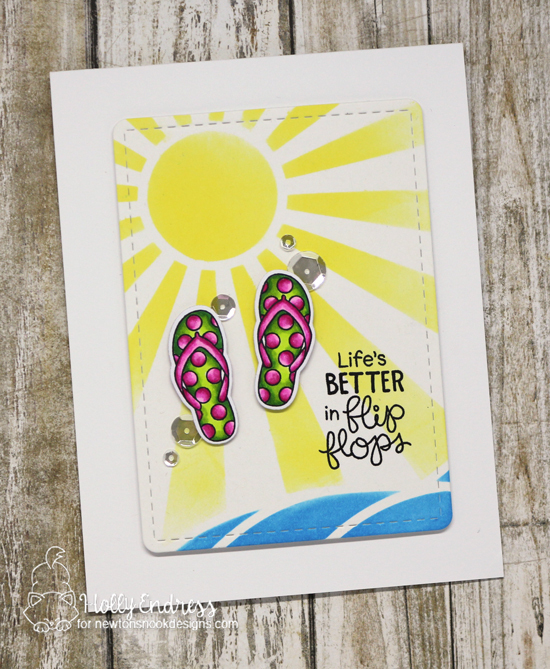 Life is better in Flip Flops! Fantastic cards! Your flip flops are adorable! Fun cards! I love your inky backgrounds. I love the sunshine behind the flip flop! Such cute cards! Love these adorable cards! They are awesome! Cute cards! The koala is adorable! This is such an awesome release! Wonderfully sweet and happy cards! Fantastic inspiration using the new products. Beautiful card! Thanks for sharing them!!!! Your cards are awesome ! Your little koala is really adorable.